Q :: Where did you get that big white case? A :: I got it at Walmart for less than $5. Here's a secret: in school, my fashion program was hugely into hardware tool boxes and fishing tackle boxes and cases. That's what I was originally looking for, but the Walmart that I go to is always sold out on fishing gear. So I ventured into the craft department and saw this guy on the cheap. Since I don't plan on taking it out of the house, it'll do. My fashion program was all about the aforementioned tool and tackle boxes because not only do they come in a variety of sizes and shapes, but you can customize compartments and they are generally much, much cheaper and are built to last than those boxes geared for crafting. Trust me, craft boxes may be prettier but they are weak. 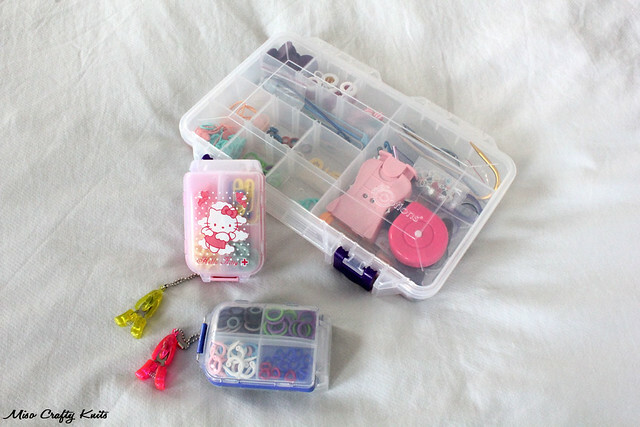 I discovered this the hard way when the flimsy latch on one crafty box gave way and I had to scramble to try to gather up the millions of bobbins and spools of thread that went flying on a busy Vancouver transit bus. Or when another box cracked and the lid almost caved in while walking across a mall parking lot to school...all my tool and tackle boxes are still going strong without a hint of wear (until you open them!). Q :: Where did you get those little cases? A :: The pink Hello Kitty case I bought on eBay. The blue one that everyone is asking about I had bought on etsy via a seller named The Gossamer Web. I just took a peek at her shop and she's just re-listed a few (she was sold out for a week there). After much searching, she is the only person/seller that sells these boxes. Unless you want to buy them in the hundreds. I highly recommend this little case. It's seriously a lifesaver and utterly amazing! If you can't score one of your own, search "pill boxes", cause that's what these cases really are! Q :: Where did you get that mini bamboo crochet hook? A :: I don't remember. It was so long ago. But my Google-fu tells me that Paradise Fibers sells them here (yay!) or Knit Picks has a metal version on a keyring for emergencies here if you really want something stronger. Q :: What are Puppy Snips and where did you get them? A :: Puppy Snips are little scissors made by HiyaHiya. They are called Puppy Snips because the tips of the scissors are protected by a cover that's in the shape of a dog head. I haven't found any retailers in Victoria that sells them, but know that Three Bags Full in Vancouver sells them. I wish more retailers sold them because they are just pure amazeballs! Online sellers for those of you who can't find them locally: Valley Yarn, Eat.Sleep.Knit, The Loopy Ewe, and Paradise Fibers. Q :: Where did you get those freakin' cute heart shaped stitch markers? A :: I bought them online, but can't remember which retailer. But they are by KA and you can get them from these online retailers: Paradise Fibers, Patchwork Frog, Just Yarn, and DreamWeaver Yarns. Q :: Where did you get that pink counter? And why am I not surprised that you have a counter in pink? A :: What can I say? I love pink! Just like the heart shaped markers, this counter is by KA. I had actually scored this dandy little tool during a stop in Richmond, BC sometime last year. I also have the red Kacha Kacha counter by Clover too (not pictured) that you can find in pretty much every yarn shop, but prefer the pink one because it has a lock on the bottom to stop it from clicking when not in use! Definitely a handy feature! Online retailers: Patchwork Frog, The Yarn Grove, and Purl Soho. Ok, I think that's it for the mainly asked questions! Don't hesitate to leave a comment, email, or PM me on Ravelry if you have any more questions. It's honestly not a bother at all. I'm always happy to answer your questions!